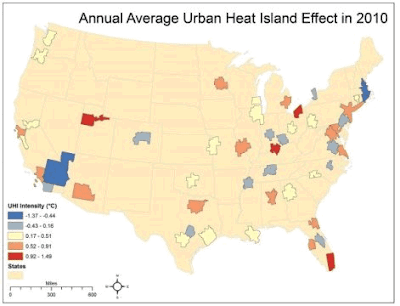 There is a new paper with the title: "The urban heat island effect and city contiguity". The authors, Neil Debbage and J. Marshall Shepherd from the University of Georgia analysed the difference between urban areas in the USA and their rural surrounds. I don't have time to go into much detail except to say that, as with other studies, they found that some places have an Urban Cool Island Effect. Not all cities are hotter than their surrounds. Fig. 4. Map of the annual average UHI intensity (°C) in 2010 for the 50 most populous MSAs in the United States. In contrast to the intense UHIs of Salt Lake City,Miami and Louisville, the negative values in Fig. 4 indicate that a city was actually cooler than its natural surroundings. Riverside and Las Vegas exhibited the strongest urban cool islands (UCIs) of −1.37 and −0.76 °C, respectively. This “oasis effect” is largely due to the increased presence of moisture and heightened potential for evaporative cooling within the cities relative to the surrounding desert landscapes (Brazel, Selover, Vose, & Heisler, 2000). The Riverside UCI was a particularly extreme case that was partially influenced by the seasonality of aridity (Fig. 5), as the summertime UCI peak occurred during a phase of extremely arid conditions according to the De Martonne index. This finding has surprised and confused deniers at WUWT, where Anthony copied and pasted the press release (archived here). Anthony didn't comment on the cooling effect. He might not have noticed. Convection plays a key role in drier cities, too -- albeit with far different consequences. In those settings -- including in urban areas of the U.S. Southwest where surrounding vegetation is typically shorter and scrubbier -- the rural areas are less effective at dissipating heat. As a result, the urban landscapes are actually 20 percent more efficient in removing heat than their rural surroundings, triggering a 1.5-degree C cooling within the cities. The readers at WUWT have come up with various notions to explain the cooling effect. As far as I can tell, none of them have managed to locate the paper but that doesn't stop them from speculating. How can the UHI effect be negative? Kev-in-Uk weirdly speculates the towns act as a heat sink. He's got that back to front. The towns that soak up heat are hotter, not colder. I wondered the same thing – I can only assume (without time to read the paper) that it is suggesting that certain urban environments act as some form of heat soak (or sink) for the atmospheric temperature thereby lowering it? Weird! Will have to read it later! That’s the first thing I thought. It appears as though they are calculating the difference between the urban area, and the surrounding area, which is partially from UHI effects, but can also be from other effects such as land/sea breezes, different elevations, etc. A very heavily irrigated Urban Area with a high density of trees relative to its surroundings would be plausible. But it strains credibility that even the thickest of urban forests can counteract the high density of asphalt and concrete roads, parking lots, roof areas, glass boxed high-rises, and stupendous use of electrical and fossil fueled energy. I live in West University, Texas, and tree rich enclave of Houston (Inner loop, SW of downtown). When you fly into Hobby on a clear night, right side window seat, West U is a black lake within a sea of city lights. The comparison is striking. If cities are bright at night, then it is hard to believe they are anything but strong positive Heat Islands. Some of the surface stations were in air-conditioned rooms rather than near the AC’s exhaust vents? I’m guessing they wanted negatives to roughly balance the positives. That would allow net UH to be discounteded as a cause of any rising world temperature. Every rise MUST be attributed to a GHG. And mostly to CO2. co2islife thinks science says surface temperature is solely determined by atmospheric CO2 and that the temperature on every spot on earth should be identical all year around, in all seasons, day and night. CO2 is 400 ppm everywhere you go. CO2 can’t cause temperature differentials. Constants can’t cause change. These climate “scientists” should be forced to explain how 400 ppm in the city can cause a temperature differential with the 400 ppm rural areas. How can a constant 400 ppm cause such temperature differentials. Also, those temperature records are made during the daytime. How does CO2 cause daytime temperature records when CO2 is transparent visible light, the light that warms the day. They have invented or discovered something that nobody has ever suspected. A negative UHI effect. I wonder if they know how badly their new discovery conflicts with all known physics. "Anthony didn't comment on the cooling effect. He might not have noticed." Otherwise it would have been a "Claim:" article. Some cities cool because of pollution and aerosols. When a bushfire smoke cloud blows over Sydney, the cooling is noticeable. @harry That was my first thought when I saw the LA Basin as dark blue. And, using confirmation bias as my guide, I immediately looked to see if the coal fired power plant regions were blue, too. Then I came to my senses and reigned in my armchair speculations, which is all I can do with sans data. I wonder if there will be more detailed analysis of this type of "microweather" phenomena. And, it will be interesting to see how this plays out in the more sophisticated of the denier crowd, if they take challenge at all. Will this new finding delay the Watts2012 paper even more? He's gotta hurry if its going to be a 'deliverable' for the US Presidential Election: looks like he's going to miss the Paris talks. I'd imagine that, with recent global temperatures, curvefitting doesn't give the desired result: so curvefitting is now so 2014. The imaginary pause doesn't exist even in rational people's dreams anymore. Richard Lindzen doesn't seem to manage these days to create the correctly incorrect conclusions from his 'interesting' hypotheses. So deniers will have little more than missinterpreting stolen emails if they don't get a finger out. And when he's gone through all the existing journals, he could start his own. Isn't that what his fake organisation is for? I don't think the two papers you cited are proposing different mechanisms of convection. Drier areas don't convect heat as well as moist areas. The cities in red are drier then their surroundings, while the cities in blue are wetter than their surroundings. While looking through the comments, most of whom hadn't bothered to read the abstract, let alone the paper itself, I was slightly cheered by self-styled "only sane man in the room" Steve Mosher in one of his anticontrarian moments. Steven Mosher: The problem is they used PRISM data. there isnt a person on the site ( except me I guess) who has any idea what prism data is and what its limitations are. jeez guys… go look at the details before spouting off. Mosher is being perhaps a little arrogant in his comment, as PRISM is mentioned in some detail in the article, and is highlighted in a couple of comments before Mosher jumps in. ".... a method for estimating UHI intensities using PRISM—Parameter-elevation Relationships on Independent Slopes Model—climate data, an analytical model that creates gridded estimates by incorporating climatic variables (temperature and precipitation), expert knowledge of climatic events (rain shadows, temperature inversions and coastal regimes) and digital elevation. The use of spatially gridded temperature data, rather than urban versus rural point comparisons, represents a new method for calculating a city's canopy heat island intensity." Previous studies have reached the paradoxical conclusions that both sprawling and high-density urban development can amplify urban heat island intensities, which has prevented consensus on how best to mitigate the urban heat island effect via urban planning. To investigate this apparent dichotomy, we estimated the urban heat island intensities of the 50 most populous cities in the United States using gridded minimum temperature datasets and quantified each city's urban morphology with spatial metrics. The results indicated that the spatial contiguity of urban development, regardless of its density or degree of sprawl, was a critical factor that influenced the magnitude of the urban heat island effect. A ten percentage point increase in urban spatial contiguity was predicted to enhance the minimum temperature annual average urban heat island intensity by between 0.3 and 0.4 °C. Therefore, city contiguity should be considered when devising strategies for urban heat island mitigation, with more discontiguous development likely to ameliorate the urban heat island effect.
" ....studies have reached the paradoxical conclusions..."
It seems (from the abstract) they have assumed from the outset that 'sprawling urban development' must not amplify UHI intensities. Surely it is most likely that 'sprawling' and 'high-density urban development' will often both amplify urban heat island intensities, but to different extents? I do hope that somewhere in the study they validated their modelling with some actual temperature data. Sorry, an extra two quoted paragraphs got in there by accident. The PRISM model is populated with real data from weather stations, Marke. You even say so above: "The use of spatially gridded temperature data,"
@Magma - The 2012 Jin paper is one of Debbage & Sheppard's references, I wouldn't take MostlyHarmless' post as a 'serious' post, or he's completely confused about 'methodology'. marke: I do hope that somewhere in the study they validated their modelling with some actual temperature data. PRISM incorporates daily readings from 10,000 temperature stations in the contiguous US, you lazy windbag. Couldn't be bothered to check? Yes, I did highlight the fact they use the 'gridded minimum temperature datasets'. But, as you very well know, incorporating data into a model is not the same thing as then actually verifying the modeled output with known effects (in this case, UHI where it can be measured). I don't understand your comment, marke. It doesn't make sense in relation to this study. The researchers used the output from PRISM, they aren't the same people who manage PRISM. Plus they used data from other sources to, for example, help determine urban-rural boundaries. The paper describes the methodology and data sources in considerable detail. Read it and then ask questions. Don't assume, in your usual D-K/denier-FUD style, that "scientists don't know nuffin'". Using minimum and gridded temperatures will minimise the UHI calculated. Their methodology is seriously flawed to the point of near irrelevance. @ MostlyHarmless: At 4 km the gridding size seems fine enough that it should preserve spatial variations on the appropriate scales. The authors note their use of the monthly minimum temperatures and offer references in support, but do not go into detail (I didn't check the references). However even the J. Climate reference you cite hardly justifies a conclusion that their methodology is badly flawed. "The gridded PRISM data has a resolution of approximately 4 km, which allows numerous grid points to exist within the urban areas of each MSA. Specifically, the PRISM products for annual and monthly average minimum temperature were used. The canopy UHI is most intense at night so minimum temperatures were analyzed rather than maximums or averages (Oke, 1982, 1987)." "In conclusion, both screen-level [2 m ground] and skin-level [satellite IR] UHIs are important for a complete understanding of urban heat distribution, local and regional circulation, and water and heat cycles." The canopy UHI is most intense at night so minimum temperatures were analyzed rather than maximums or averages (Oke, 1982, 1987)." Furthermore, the skin-level UHI is stronger during the day and summer (July) than during nighttime and winter. Any risk of circularity in calculation? 1. Say, over time: a stable satellite data readout, then allow for increased CO2 in atmosphere in calculations. 2. Hey presto, we therefore must have had a surface temperature rise? The MODIS Tskin product is not without uncertainty; retrieving Tskin requires a calculation of radiative transfer to account for atmospheric emission and molecular absorption, which is time and resource intensive (Jin and Dickinson 2010). All cynicism on my part aside, this is impressive and detailed work. Given how broken the satellite products are looking these days, anyone seeking to reduce complexity would do so by using surface thermometry and gridded temperature reconstructions. Anyone still trying to argue that warming is over-estimated is in denial.